Our whingy hiccups from Milan have been all sorted out and we're back in holiday mode and have loved Florence. Maybe it was just Milan that we didn't really click with? Talk about first world problems though, sheesh. We took the train from Milan to Florence on Monday morning, and were happy to check in to a little apartment just outside of the city centre that is clean and bed bug free. Thank goodness! We had zero expectations of Florence, and nothing on our list of things to see, so it's been quite nice to wander around without too much on the itinerary. We found ourselves at the river 10 minutes into our visit, completely blown away at how beautiful it was. 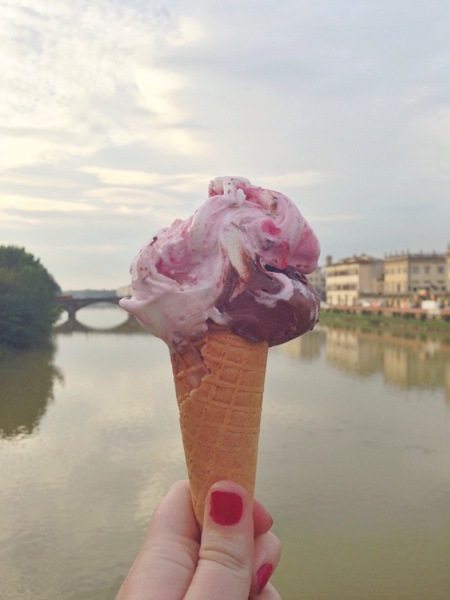 Gelato and some views, we were suddenly liking Italy a whole lot more. Our day today was also a low key one, although we walked a whole lot more (and a lot more athletically) than we'd anticipated. We visited the Piazzale Michelangelo, a square which sits on top of a mountain with beautiful views over Florence. We took the very long way around, walking up lots of winding roads and steep staircases to the top of a different point, that had no views at all. Back down the roads, up another hill and then up the steepest staircase my calves have ever experienced. The views were definitely worth it though, and we were glad we had pushed through! We thought about popping in to some galleries too, to see Michelangelo's David and Botticelli's Birth of Venus, but the multiple queues and throngs of tour groups stressed us out and we gave it a miss. Don't tell my high school art teacher! We wound our way through cobblestoned streets, patting puppies and eating prosciutto paninis, and stopped to admire the Cathedral of Santa Maria del Fiore. It's my personal favourite in the cathedral stakes, incredibly intricate and almost pastel coloured after so many years of standing in the sun. Amazing! One of our favourite things to do on holiday is visit local supermarkets. I love seeing the different packaging and treats of different countries. Joshua picked up a big bottle of Peroni for €0.82 and I found a miniature tub of Nutella with a gold lid! Emergency Nutella!